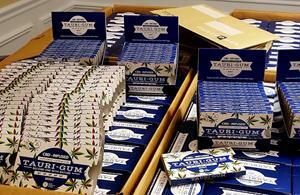 Tauriga Sciences Inc. Now Shipping its CBD Infused Chewing Gum from its Fulfillment Facility! Tauriga Sciences / Press Releases / Tauriga Sciences Inc. Now Shipping its CBD Infused Chewing Gum from its Fulfillment Facility! New York, NY, March 22, 2019 (GLOBE NEWSWIRE) — via NEWMEDIAWIRE — Tauriga Sciences, Inc. (OTCQB: TAUG) (“Tauriga” or the “Company”), a revenue generating Company that operates through the development, distribution, and licensing of proprietary products as well as the evaluation of potential acquisition opportunities and equity investments, today announced that it is now shipping its CBD Infused chewing gum (branded as: Tauri-Gum™) from its fulfillment facility. To date, the Company has received E-Commerce orders, Orders by Mail, Orders from large Distributor(s), and an Order from a Physician. The Company continues to be encouraged by the indications of demand and believes that its product may represent a high quality/low risk opportunity for potential customers to enter the CBD space. The Company has also been focused on Research & Development (“R & D”) initiatives, to enhance its Tauri-Gum™ product line.